Writing an e-commerce proposal can be so challenging because it goes beyond just writing your solutions to present to a potential client based on their needs. In fact, that’s just the tip of the iceberg. An e-commerce proposal—good or bad—gives a first and lasting impression of your capabilities and skills as a web developer. It needs to be written in a way that the potential client is convinced that you are the right person for the job. Another is the reality that you’re not the only one sending an e-commerce proposal to the client. It is crucial to write an e-commerce proposal so that it stands out from the rest. Nothing is more frustrating that to spend a great deal of time writing an e-commerce proposal only to have it rejected in the end. When that happens, you can’t help but ask where did you go wrong? More often than not, it is not about your skills or talents or experience. It’s the e-commerce proposal you submitted. Submitting an e-commerce proposal full of spelling and grammar mistakes gives the potential client a glimpse in the kind of work that you will submit. If it’s full of errors, how can they be sure that you’ll do any better on the project? Another mistake committed when writing an e-commerce proposal is putting too little information that the potential client is left clueless about what are you offering. On the other side of the spectrum is flooding your e-commerce proposal with too much information. Clients are very busy people. If they don’t find what they are looking in the first two pages of your e-commerce proposal, they won’t bother reading through everything. It’s true that you need to get your potential client see that you are the best person for the job. But if that’s all that’s written in your e-commerce proposal, it will just turn off your potential client. Although your potential client is requesting for an e-commerce proposal, they might not really be familiar with all the jargon used by most web developers when writing an e-commerce proposal. If the client doesn’t understand the solutions you’re offering them in your e-commerce proposal, it opens the door for another web developer to capture their attention and win the project instead of you. 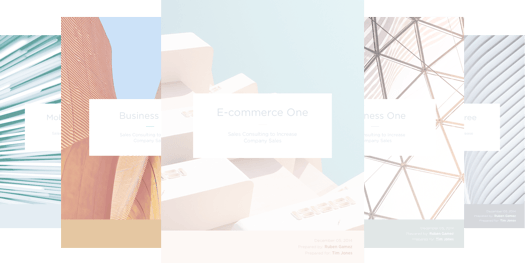 Lots of web developers use proposal templates to write their e-commerce proposal. While there is nothing wrong with that, the problem is that many don’t take the time to edit these templates so that it still looks personal and specific for the client and their needs. This may seem to be a no-brainer, but you’ll be surprised on how many people writing an e-commerce proposal forget to provide their contact information, giving no way for the client to get back to you. Now that you know what the common mistakes web developers commit when writing an e-commerce proposal, here are some ways on how you can make sure that you avoid them. Instead of submitting your e-commerce proposal right away, give yourself a few hours or even a day before you proofread it. This way, you’ll be approaching your e-commerce proposal with fresh eyes and will be more able to see spelling and grammar errors. When you read something out loud, your brain is more focused on the material and will be more able to pinpoint mistakes and errors that may be present on your e-commerce proposal. To make sure that your potential client will be able to understand your e-commerce proposal, get someone who’s not a web developer to read through it. If they can’t understand your e-commerce proposal because of too much jargon or errors in grammar and spelling, it’s likely that your client won’t either.